Nicholas Bastidas, MD, provides microtia surgery in the general New York, NY, area. We work to help you and your loved ones respond to microtia so that you or your child can have the ears that you deserve. Our surgery also helps the patient gain total hearing. We offer three different surgical procedures in NYC to correct your or your child’s microtia. 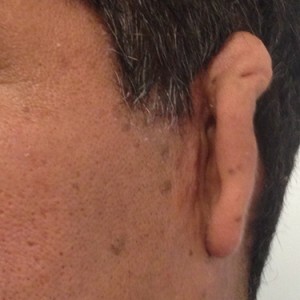 Dr. Bastidas has trained some of the pioneers in microtia reconstruction and is a regional expert in these procedures. Consider the three main options for reconstruction. The name of this technique effectively describes what the procedure is. Essentially, rib cartilage graft reconstruction uses rib cartilage from the patient to sculpt an ear. The ear continues to grow throughout the child’s life because it is from the child’s own tissue. We ensure that the child has sufficient cartilage for this procedure, which often means waiting until the child is eight to ten years old. Cartilage graft reconstruction often requires multiple procedures. Medpor uses a polyethylene plastic implant for the procedure, which allows Dr. Bastidas to perform the surgery much earlier than cartilage grafts. This surgery can take place when the patient is as young as three and is a much simpler procedure that often occurs in a single stage. We perform adjustments to ensure that the implant is appropriately installed and will give the patient all the benefits of a full, natural ear. Prosthetic ears are synthetic and often unreliable, so we don’t recommend them, especially for children. We may recommend prosthetic ears for adult patients. All of our medical interventions address both the deformity of the external ear and any ear canal deficiency. Our goal is for you or your child to hear better and for the ear to have the appearance that you desire. When you or your child need microtia surgery in the New York, NY, area, come to Nicholas Bastidas, MD. Call (516) 497-7900 or (212) 485-0616 to schedule your appointment today.